Taking a step back, the next photo is a good representation of where we began with this project. We'd moved everything (save for the bed frame) out from the room and slept in our guest room throughout the weeks the restorative work was taking shape. 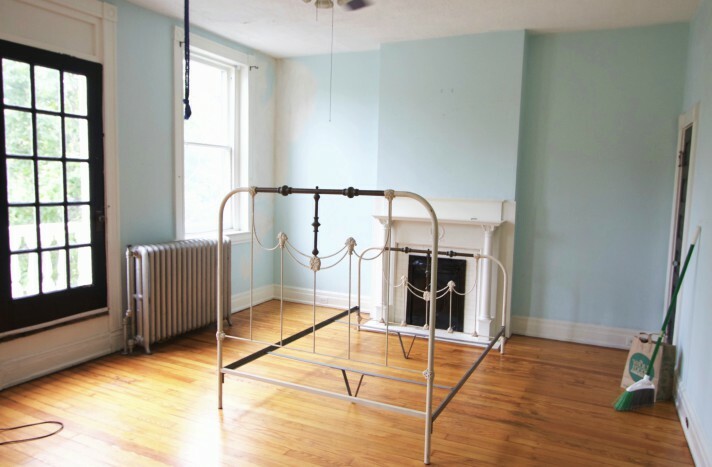 For those curious, there are a variety of "before" photos from how our bedroom looked shortly after moving in here and here. This was a point in time when we had more of a hodgepodge of furniture from the move without an understanding of where things would best fit and were focusing energy on rooms like our front office. 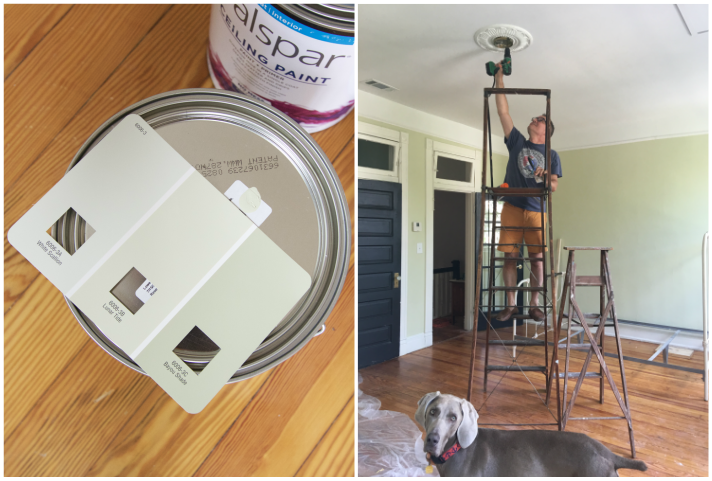 In a nutshell, the work entailed restorative repairs to water damaged plaster walls, smoothing out the texturing on our bedroom ceiling, installing a new attic access system, bringing in picture railing and painting everything with a fresh new coat and color. We couldn't wait to get started! 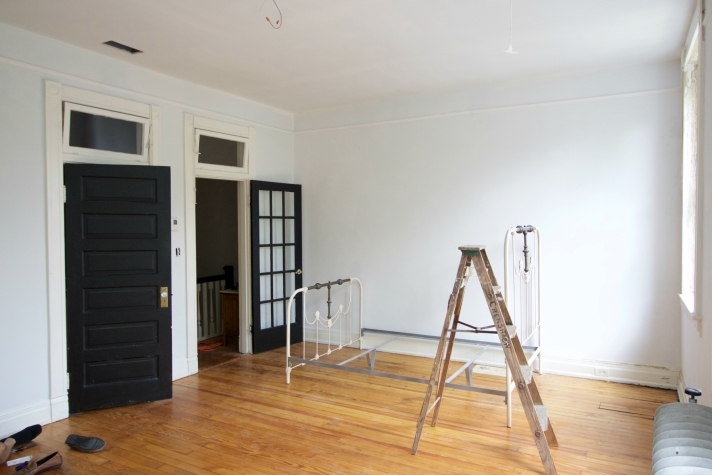 We addressed the bulk of these repairs over the course of last autumn and decided to break out the work into zones of what we considered manageable DIY vs. hiring professionally. We were confident taking on the initial wall prep, priming, painting, attic door installation and electrical components, though wanted a higher degree of precision and expertise on areas like plaster wall skimming, drywalling and moulding installation where we ultimately brought in professionals. So, why all the need for repairs? Well, it all started with a little bubbling in the walls next to our bedroom window, that over the course of 2 years snowballed into extensive wall issues from what we eventually pinpointed as water damage. 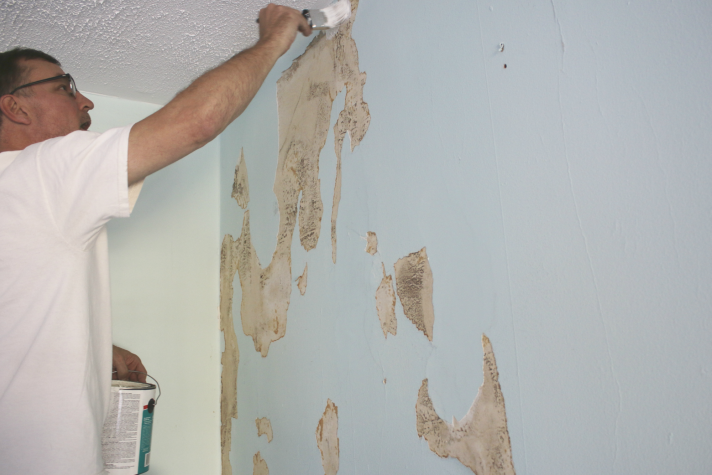 Plaster walls are an interesting thing — they're filled with character and will tell you almost instantly when there's a water issue by bubbling out in the areas of moisture. 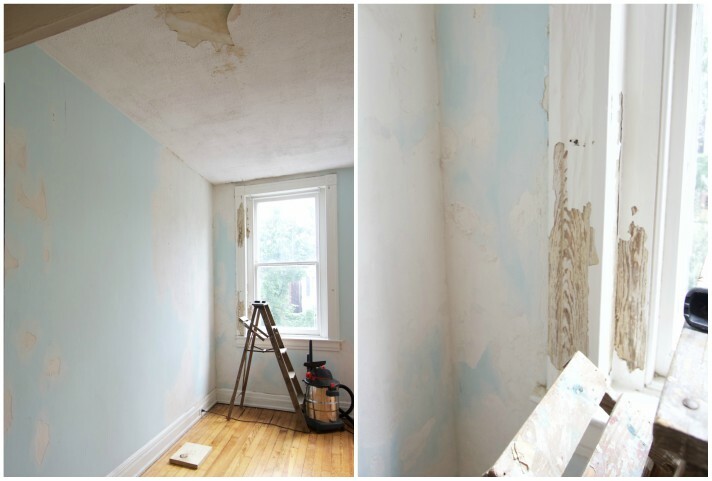 When we bought the house, the walls were pristine but we quickly learned that unless water damage is addressed from the root of the problem then the cosmetic issues will only return time and again. Because the previous owners didn't address the water source, it wasn't long before our pretty walls turned into something different all-together (imagine the upside down from Stranger Things). I have to warn you that some of the damage in the photos we've included in today's post may appear jarring. 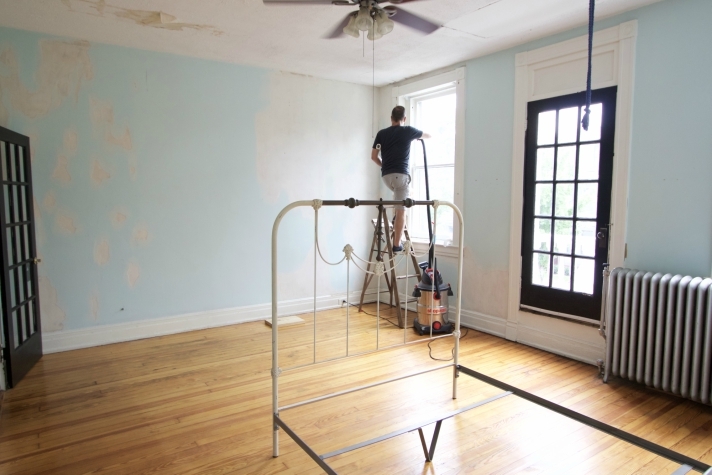 We've learned a whole lot about historic home upkeep over the last 6 years and water-damaged plaster walls seem to be par for the course. We're no stranger to wall damage in this house. You may remember we've tackled worse in both Brandon's room and Stephanie's room. While much of it wasn't pretty at all, we're so happy to be at a point now where the water problems are fixed and our bedroom is back and better than ever. 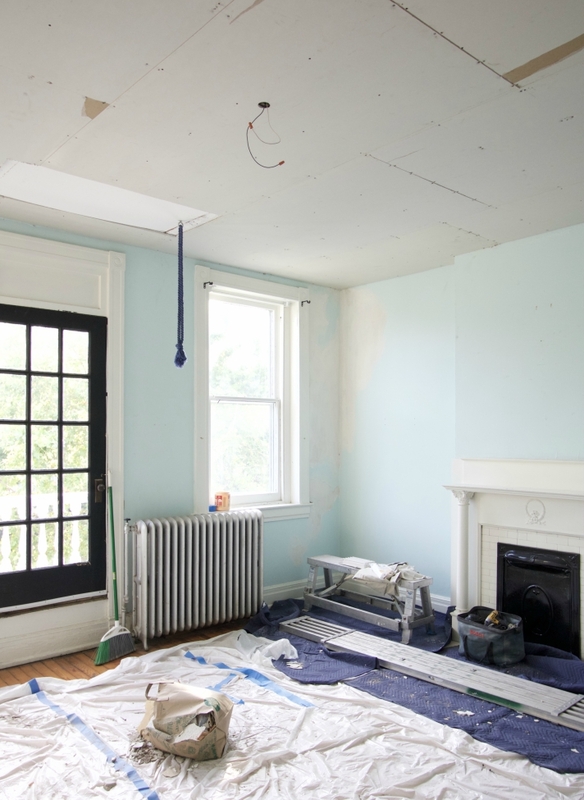 I took on portions of the initial prep work, including scraping down the bubbling on the plaster and applying 2 thick coats of Drylok overtop all of the affected areas. Drylok is a masonry product (like a heavy duty primer on steroids) known for its extreme waterproofing and mildew resistant quality. 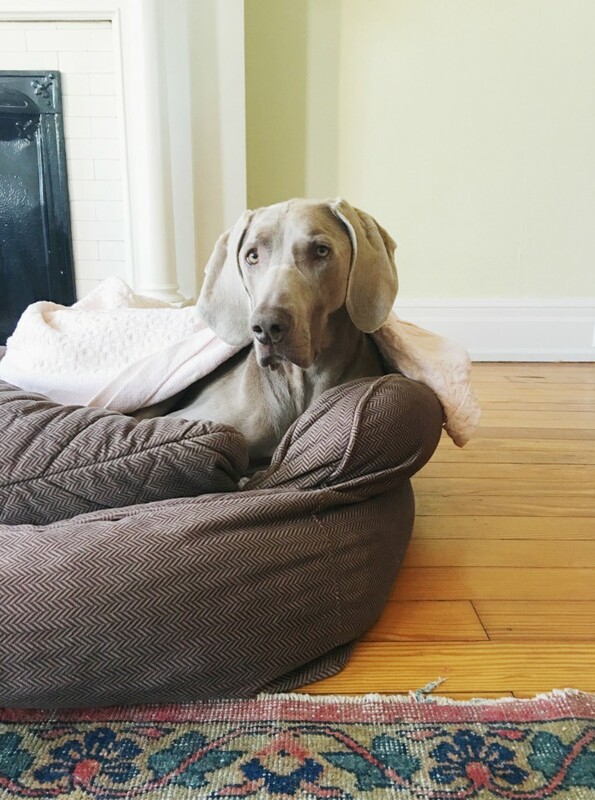 It was recommended by our wall specialists and a more pricey measure to take at $45+ a gallon, but we've considered it well worth it considering how it's held up and saved in the end by applying it ourselves. Our bedroom also had a thick texturing on the ceilings. I'm not sure if it was decorative or to mask the previous staining in the plaster — but we were both eager to smooth this out. 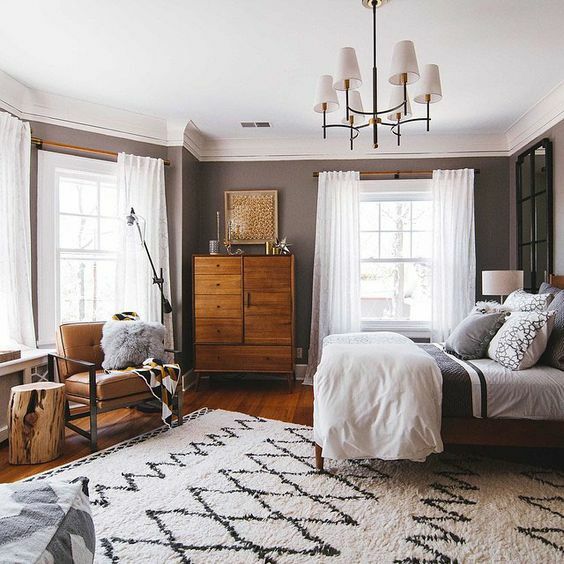 Textured ceilings may not seem like a big deal in general, however, if you think about it, in the bedroom it's a wall that comes into focus quite frequently (the first thing you see before going to bed and when waking up). The below picture shows a good view of this room at the stage just before we had the professionals come in. The walls were stripped and sealed, the room was clear and we'd cleaned everything top to bottom with a shop vac. Both Mary and I were excited to have a completely blank slate to work from so to speak. 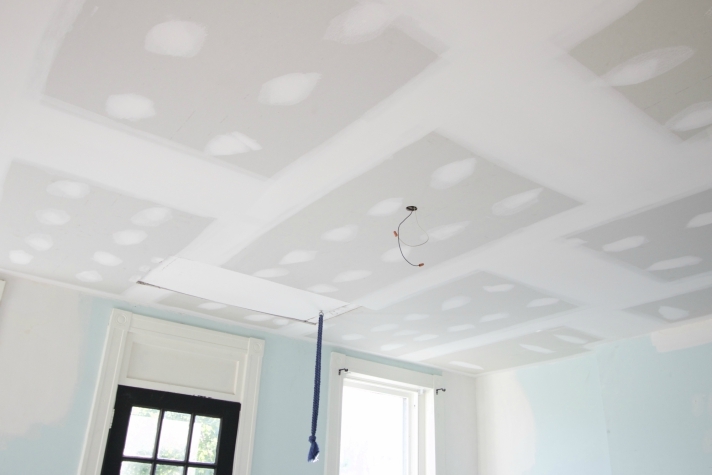 For the professional work, the drywall installation on the ceiling was our first step. 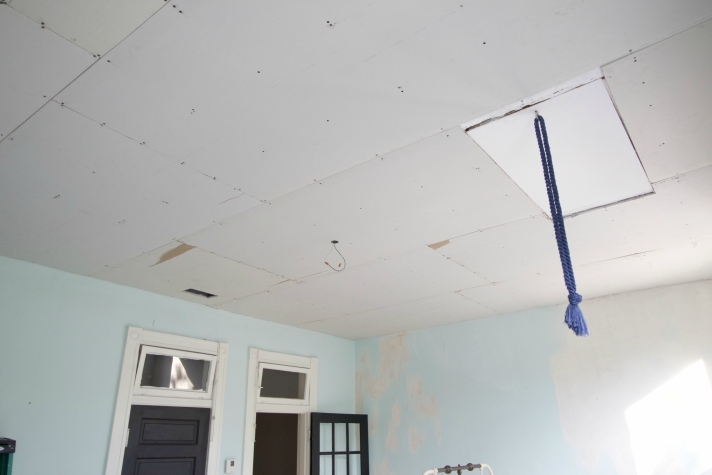 They used a very thin quarter inch material that was screwed directly overtop the textured ceiling and went up over the course of a single day. At this stage, the drywall looked rough without being mudded, but we were already so excited to bid farewell to the old ceiling that we didn't mind at all. The following day was when the real magic began to happen. In the next set of photos you can see where the ceilings were mudded completely smooth and the plaster walls were skim coated with new plaster. It was amazing to see how much of a difference 2 days of work could make in a single space. From here, we had a brand new attic access door installed. It came in a kit with a new metal ladder and is overall much safer. 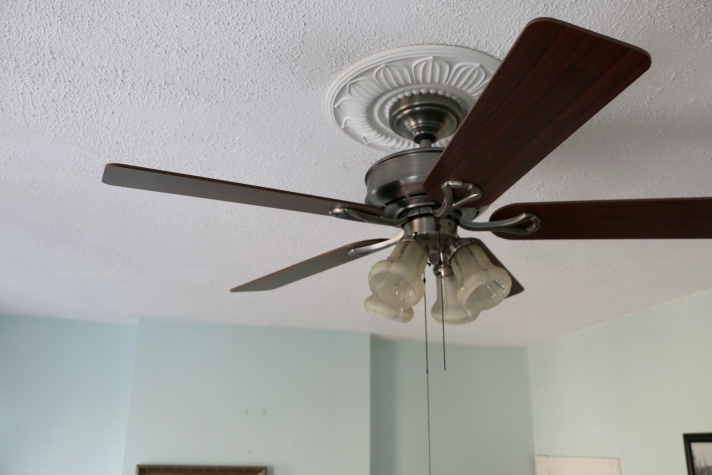 This access was one of the areas that came up in our home inspection as needing attention, so it felt great to knock it out while updating the rest of the room. The best part? We finally threw away the giant blue rope we swore we'd take down on day one of moving into the house but lived over 4 years with (yeah, keeping it real). At this stage, we were really getting into the home stretch. 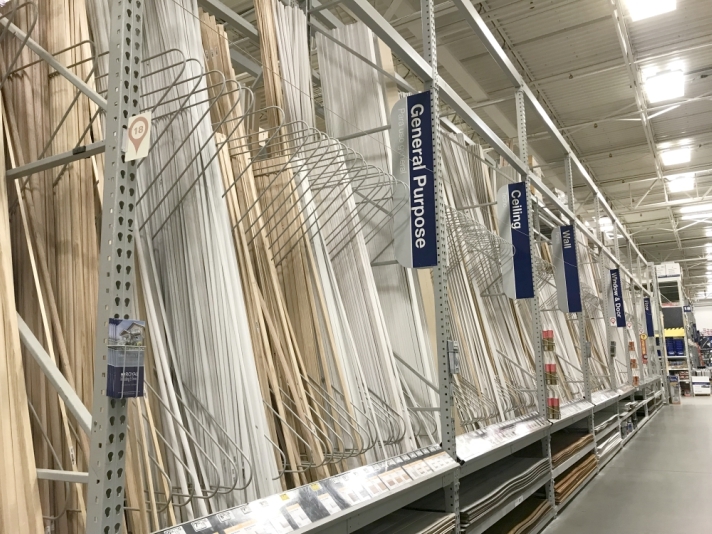 To save on costs we opted to prime the walls and ceiling ourselves, but there was one last project Mary had in mind for our crew while they had the expertise and tools on hand before entirely handing it back over to us — picture railing. We didn't have original moulding to work from like we do in the downstairs, so we got creative and bought pre-primed pieces of general purpose trim from our hardware store. They come in long 12 foot strips (like these) in various shapes to choose from. 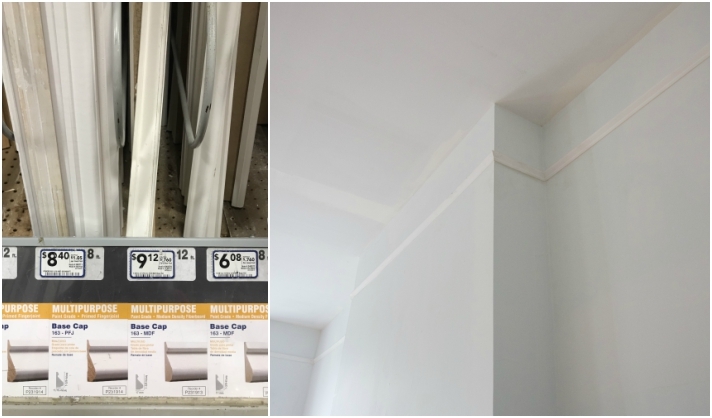 At under $10 per strip, we came in under $100 in total to have the moulding installed. 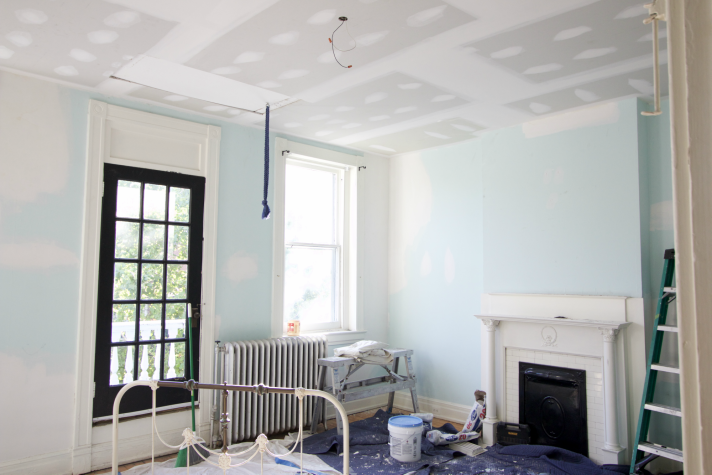 Here's a look from the other angle of the room with the moulding installed, the walls and ceiling primed. It was at this point we officially deemed it time to take over the reigns and work on the fun parts (fun is a general term) —wall color, lighting and of course bringing all the new furniture in! 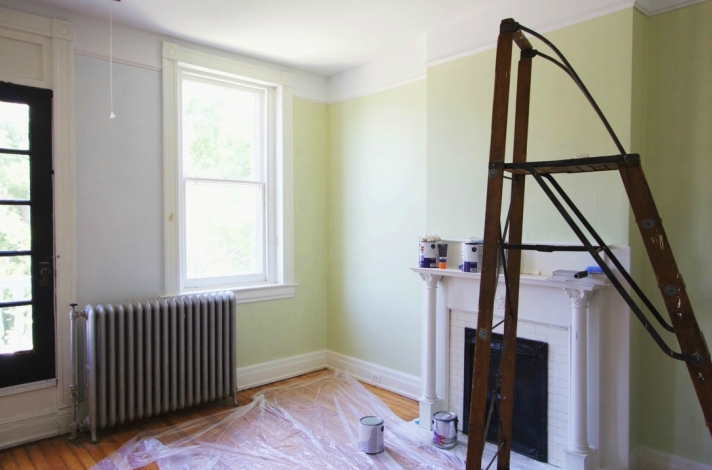 We opted for a bright white in a satin gloss finish for the trim and moulding, then ultimately landed on a shade of green for the walls. It's Valspar's Lunar Tide (the middle shade in the swatch below) and looks much more subdued in person than the lighting may suggest in the photo above where it was still wet. 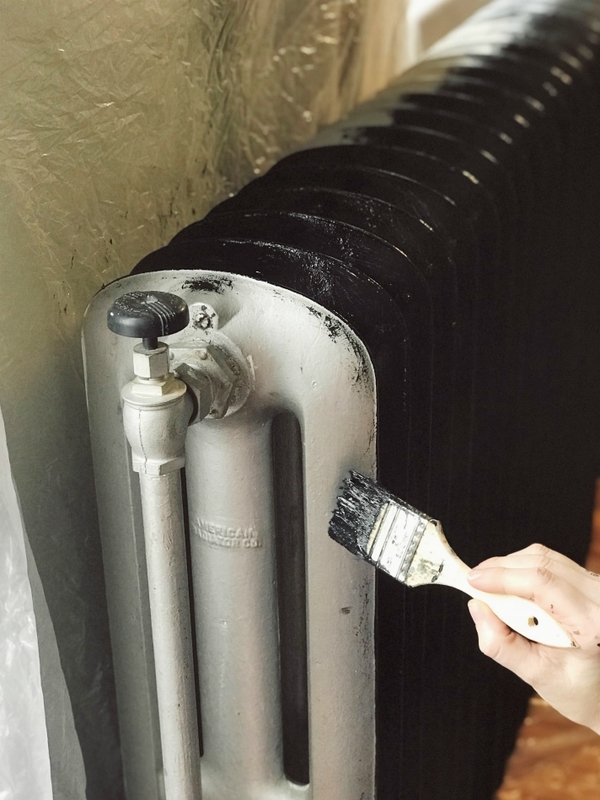 While we hadn't considered it at the time, just this past weekend Mary decided to paint the radiator in this room a solid black semi-gloss finish and we can't wait to share the final outcome for how it helps tie everything in the room together. 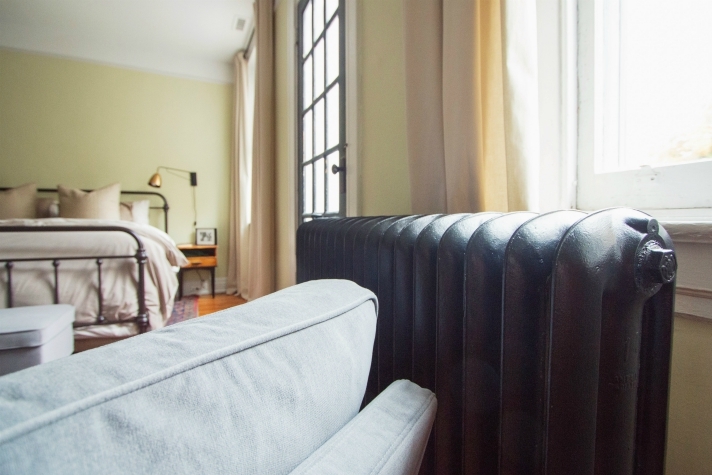 For now, you can see how the radiator turned out in the photo at the opener of this post. 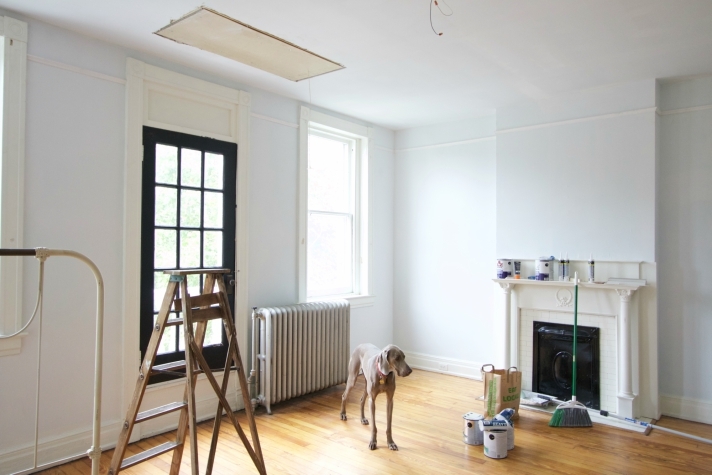 Tip: The key to precisely painting an installed radiator is taping a plastic drop-cloth between the wall and radiator. It's impossible not to streak the wall with paint otherwise! Once the paint dried and we reinstalled all the fixtures, it's just been a matter of bringing in all the new pieces and creating a space that feels like our own little escape.